Two giant stars with Robert Zemeckis behind the lens. Okay, we’ll give this a go. A classically-inclined wartime romance that doesn’t warrant a second thought. It’s hard to know how movie history (as opposed to real history) will look back on the Hollywood actor Bradley Pitt. He certainly presents himself as a man of refined taste, down the years either working with or helping to bankroll a happy slew of idiosyncratic directors, assuring that the movie landscape at the very least remains a little more than merely curious. You watch a film like Allied, a two-bit, combed out John Le Carré knock-off, and wonder back to the time when Pitt was a real physical presence to be reckoned with rather than a delicately chiselled albeit immovable marble statue. He was astonishing in Terry Gilliam’s 12 Monkeys, entirely unselfconscious and embodying a role that asked nothing more of him than to let everything hang out. As Canadian Wing Commander Max Vatan in Allied, Pitt helps Britain trounce the Nazi scourge, but does so in a way that seldom offers the actor a chance to really roll up his sleeves. In times of war, emotions are a totem of weakness, and so Vatan drifts through his eventful life with necessary deference. Guess away as to whether this is a hardened soul giving little away for the purposes of narrative tension (and national security), or it’s just Pitt’s own haughty unwillingness to take a performance to the edge. It’s easy to drop terms like “soulless” into film criticism from the relative safety of the laptop barricades, but Pitt’s turn here often strays into the realms of the coldly robotic. Maybe he comprehends the essential schlockiness of the material, or perhaps has his mind on other things, but that’s not Brad Pitt up there on the screen, more a melancholy ghost who looks a bit like him. Yet he remains, from hairline to Hushpuppy, a bonafide movie star. The shot where he’s waiting for a meeting in Casablanca wearing a beige suite, knees crossed while sat on a bench, creates a momentary static affect that only someone like Pitt could truly achieve. And the way in which he walks with a light strut, allowing the camera to drink in the contours of his sartorial finery, is the preserve of a master. Yet these breathless asides are little more than pin-pricks of pleasure in a complex film which tries its darndest to be as uncomplex as possible. 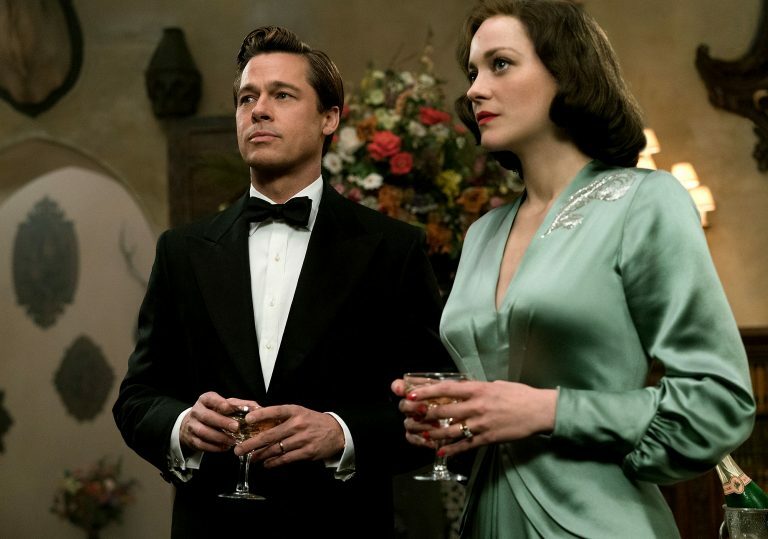 Allied is directed by Robert Zemeckis, and it’s a small cut above 2015’s piece of misty-eyed high-wire hokum, The Walk. 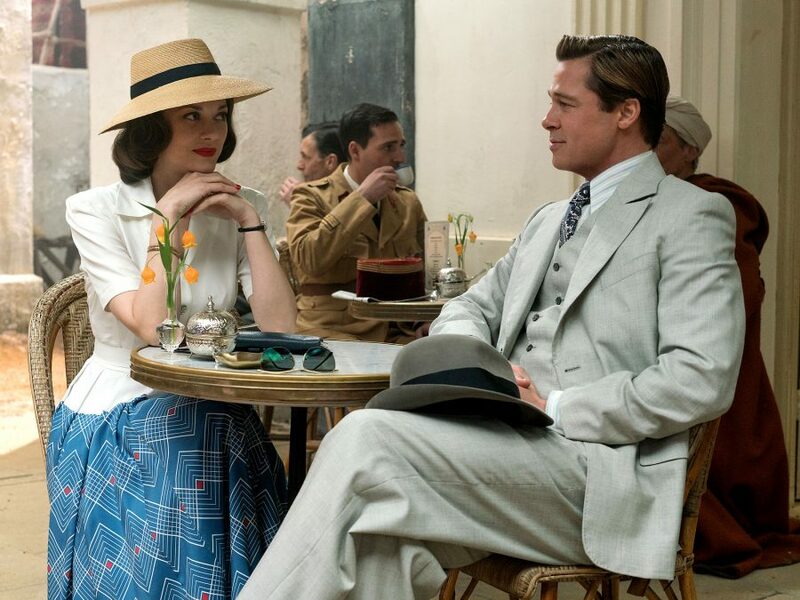 It co-stars Marion Cotillard as Pitt’s romantic foil, a beautiful Parisian resistance fighter posing as his wife in an elaborate sting to assassinate a local ambassador in cahoots with the Germans. Yet emotions start to buzz, shirt buttons start to pop, and Vatan slowly yields to his personal mantra of no funny stuff while on the job. Even after having her fully checked out, something is not quite right. The film, like Pitt’s performance, is all surface and no feeling. For the story to work, you need to feel and care for the fate of these two lovers, and Zemeckis (working from Steven Knight’s ultra-schematic script) does this with maximum efficiency and minimal magic. Of the vast supporting cast, only Jared Harris manages to assert himself with any dignity – indeed, he’s fast becoming one of the most reliable supporting character actors in the biz. It’s not that other side players don’t give their all, it’s that they’re given very little to work with themselves. There’s action and drama and emotions the size of a German bomber crash-landing on to Hampstead Heath, but it’s a film with very little psychological game. The outcome is all but an inevitability, even when it doesn’t quite make much sense. The French director Eric Rohmer told a similar story in his penultimate film, Triple Agent, and he achieved brilliance by channeling the thrills of seeing people talking in rooms, unpicking words and nuances, becoming spies in their own lives.